The 1960's was a fashion revolution. 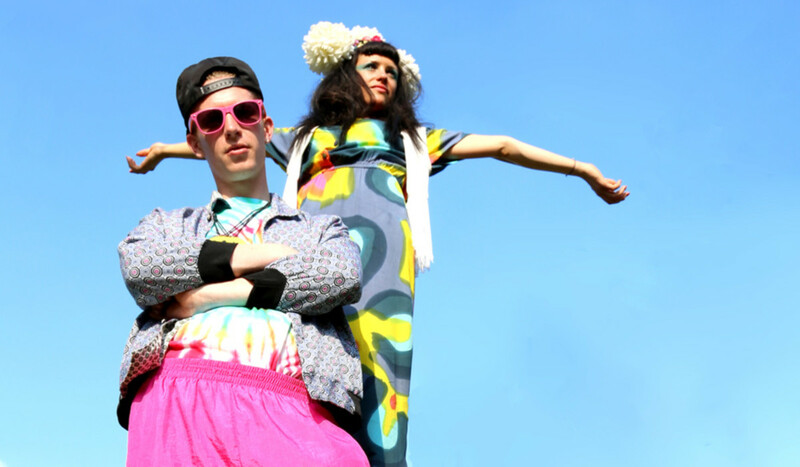 The decade of hippies or hipsters and bright colors and unisex clothing. Tie-dye t-shirts came into style, people grew their hair longer. Stiff up dos were common. 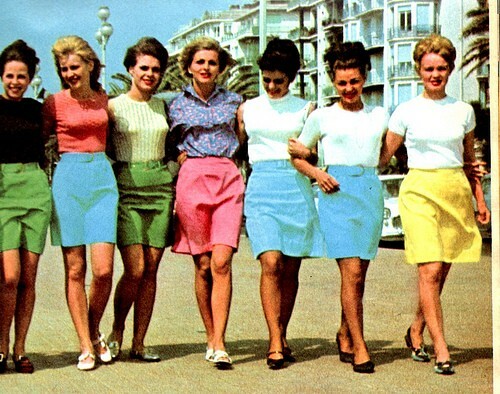 The birth of the mini skirt for women happened. Women showed much more skin after years of conservative clothing and behavior. Women wore open heels and brought emphasis on their legs. The Beatles were really popular at this time and heavily influenced style. More printed clothing with bold colors came into style. Dresses above the knee were really popular thanks to fashion sensation Twiggy. 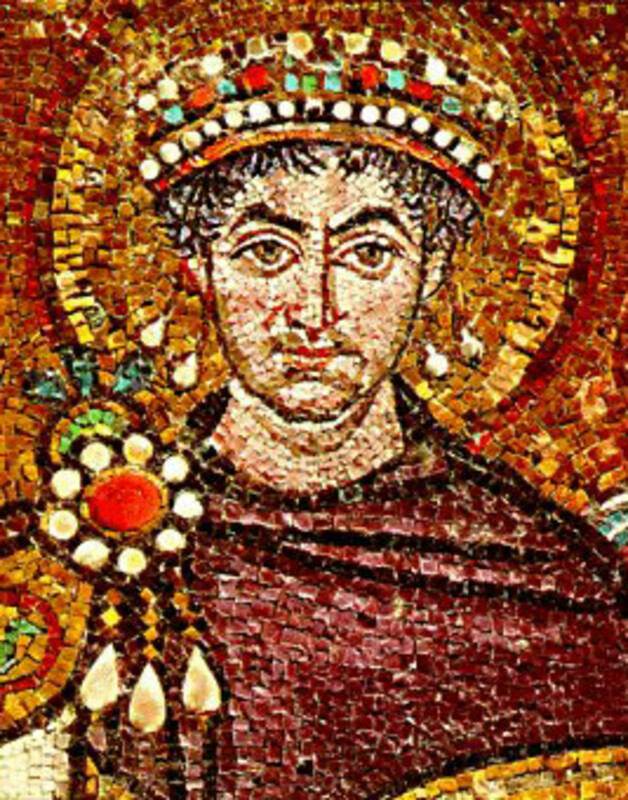 Male fashion also evolved because accessories and to mix and match became popular for men also. At the end of the 60's, women wore more clothing with unexpected or no hemlines. They wore things to make them appear taller or slimmer. Fashion became even more gaudy than the late 1960's. Platform shoes were highly popular for men and women. Polyester was used for a lot of clothing in the 70's. Bell bottom jeans, and pant suits were worn to. (I know because of my grandmas closet of old clothing) Big afros were in style as well as American girl blonde feathery hair. Jewelry like medallions and gaudy women's necklaces were in style. 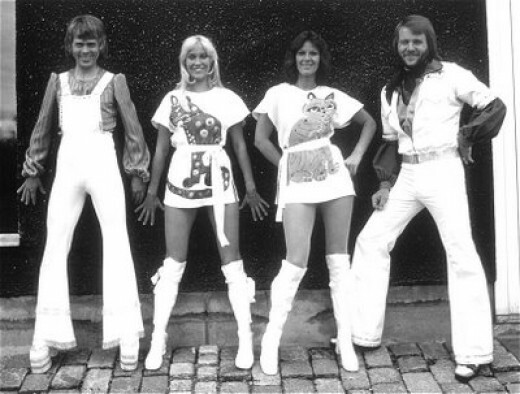 Disco was really popular and women wore bell bottom jump suits and platform heels. Fashion was al ot funner in the 70's. 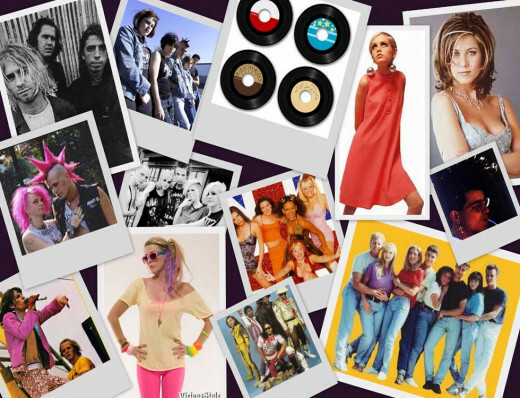 The 1980's were all about colors, make up, accessories, crazy hair styles, jewelry, and fabric. Cyndi Lauper was very iconic in the fashion world in the 80's too as well as Madonna. Music videos has an impact on teens fashion. Athletic brands like Nike, and Reebok were wildly popular. The Coca-Cola brand was worn a lot. Feathery bangs were in style, baggy sweater dresses. The more colors the better! 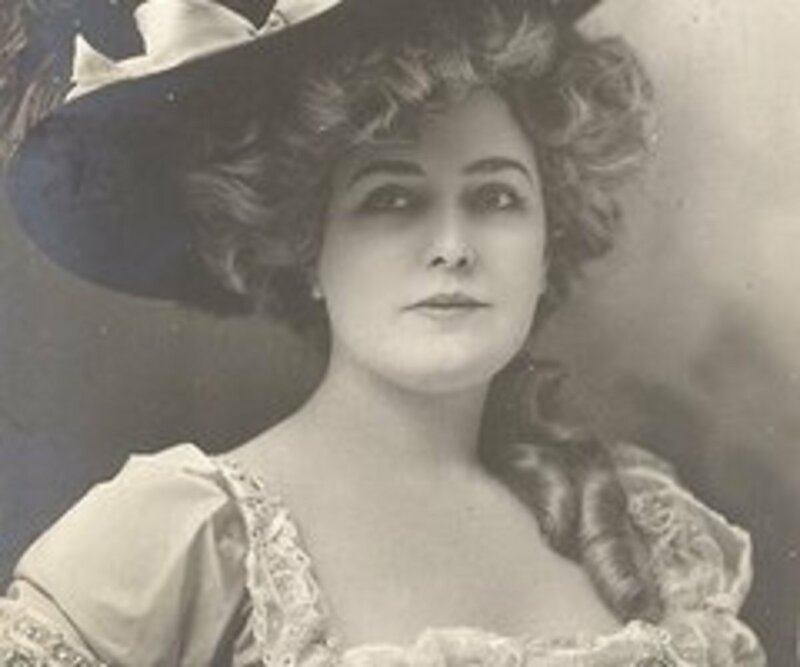 Women wore more big, dry, full of hairspray hairstyles. Teens wore crop tops, leggings, cut up tops, fish net, joggers, leg warmers, and converses. It was very similar to what is in style today. The 90's were more grunge. Music artists that heavily influenced style was Aaliyah, group TLC, Lil' Kim, Tupac, Destiny's Child, and SWV. Hip hop style was popular for younger people. Name brand clothing like Tommy Hilfiger were popular and worn by Aaliyah a lot. Highlighted hair, CD players and leather skirts were worn by teens. As a child I remember wearing jumpers and big scrunchies. Fashions of the early 2000's is what we remember the best. White Air Force 1s were in style in the early 2000s as well as 2015. Teens still wear them now after they made a comeback. Clothing we all know like Rocawear, Dereon, Sean Jean, Ecko, Baby Phat, Fubu, and Bebe. Regular people and celebrities rocked these brands too. Women wore platform sandals with long above the ankle skirts. "Chinese Slippers" and Jelly Sandals were in style. Jelly Sandals and platform sandals are insanely popular this year for summertime. Big, puffy jackets and furry boots were worn a lot. One I cannot forget is Timberlands. They were in style in the early 2000's but even more now. They have even made more colors and prints for Timbs. Remember jeans with no back pockets? Gladly they never came back into style. Teens wore studded belts with their jeans. A popular thing in hop hop was a du-rag with a hat over it. Babies, kids, and adults wore track suits of every color. Even I remember track suits. Highlighted hair was still in style as well as cornrows for guys and girls. 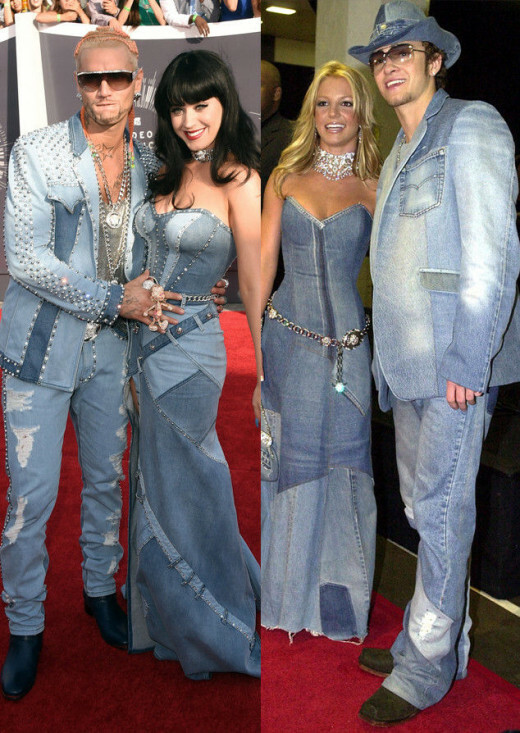 It was lots of denim! Denim skirts, shirts, dresses, bags, and even shoes. 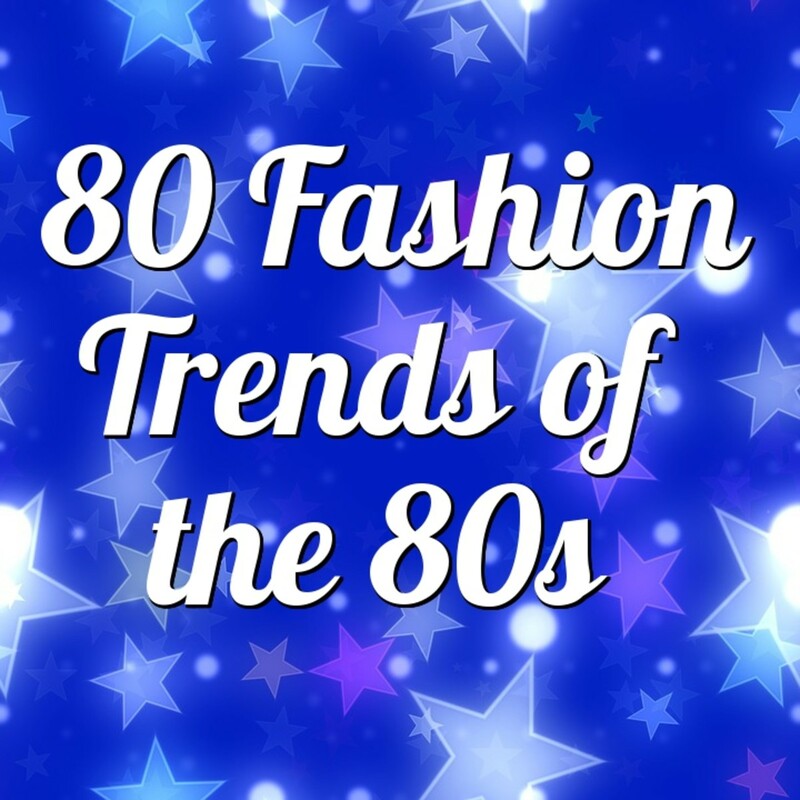 What fashion decade do you say was the best?